By Peter Wells: Maybe it’s about time we stopped the Mayweather, Pacquiao, who’s the best in the world argument. Andre Ward may just have trumped them both with another completely dominate display. Ward has already cleared out the Super Middleweight division, and Chad Dawson the best Light Heavyweight in the world, and a top 10 pound-for-pound fighter himself didn’t even come close to ending Ward’s unbeaten run that’s stretches back to when he was 12. When you look at Mayweather’s and Manny’s fights the last few years, they haven’t won each fight as clearly as Ward has. Andre has fought the best in his division and the best fighter in the division above, Mayweather and Pacquiao haven’t fought one another meaning they haven’t fought the best in their division. Enough of that, this isn’t an article to argue who is the best in the world. Last night was Ward’s night as he was simply awesome in dominating the ultra talented WBC Light Heavyweight champion. In the build up many worried if Dawson could make the weight well, but looked good at the weigh in and weighed almost 10lbs heavier than Ward on fight night. Dawson enjoys fighting at his own pace, using his jab to control rounds. ‘S.O.G’ took away Dawson’s jab from the very start and after a slow first upped the pace to suit himself. Ward’s footwork is something to admire. Any youngster starting boxing should definitely watch the way Ward uses his feet to set himself up to land shots and avoid shots coming back. Ward is also a great thinker and may well have won this fight using his brain, seeing shots that others wouldn’t notice if they stood their for 5 minutes let alone in a split second. ﻿The third round was the key round in the fight. Andre Ward and trainer Virgil Hunter clearly knew the short left hook was a key punch and after slipping a long right from Dawson Ward clipped Chad’s chin with a precise left hook. Dawson hit the canvas but seemed to quickly regain his legs. The 4th was almost identical, Dawson throwing a wide right hook and Ward stepped in, using his impressive footwork to land his short chopping left flooring ‘Bad Chad’ for a second time. Ward went for the kill like never before but couldn’t quite find the right punch to bring an end to proceedings. After that Ward dominated and Dawson had already lost all confidence in the fight. Ward fought exceptionally both on the outside and the inside, landing uppercuts whenever the two clinched, not allowing Dawson a moments rest. Andre continued to box brilliantly before a quick combination had Dawson on wobbly legs before another left hook put the Light Heavyweight king down. Dawson rose again but sensibly told referee Steve Smoger to stop the fight. Both fighters acted like gentlemen after the fight. Andre gave Dawson a lot of credit, while Dawson offered no excuses for the defeat despite Larry Merchant’s ridiculous attempt to get Chad to bite the bait. ﻿﻿Ward has proven he is in another league to those fighters areound him, and he may be waiting on fighters moving up to fight him from Middleweight unless he moves up himself to Light Heavy. Dawson can now move back to his natural weight class, where big fights with Tavoris Cloud and Jean Pascal await. 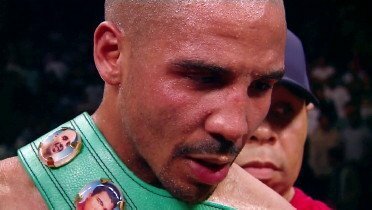 There is no shame for Dawson losing to Ward, there never is when losing to someone as great as Andre Ward. Next boxing news: It was the WEIGHT!